Here at the Baltimore Marriott Waterfront, we invite you to discover waterfront relaxation in the heart of Baltimore. We boast spacious, tastefully designed hotel rooms and an extensive array of first-class amenities, as well as a terrific hotel location in downtown's bustling Harbor East district, just steps from top-quality shopping and dining. 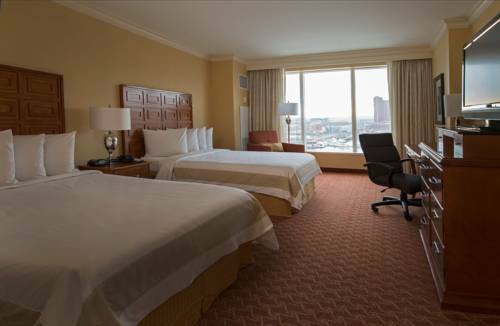 Our hotel rooms and suites offer flat-screen TVs, deluxe bedding, an ergonomic work space, and more, while many rooms feature striking waterfront views of Baltimore's Inner Harbor. Savor fine dining at Apropoe's, our hotel's signature restaurant, take a dip in our indoor pool, or stay productive at our business center. Consider hosting a wedding or meeting with us here in Baltimore; we provide over 50,000 square feet of sophisticated event space and a picturesque waterfront location. In addition, our hotel's ideal placement offers simple access to the Baltimore Aquarium, Fells Point, and Camden Yards. Travel brilliantly with us at the Baltimore Marriott Waterfront. Savor delicious Baltimore-inspired cuisine here on the waterfront. Apropoe's, our hotel's signature restaurant, serves innovative fare crafted from locally-sourced, sustainable ingredients. Enjoy handmade, locally sourced food without the fuss. All orders include eco-friendly utensils, napkins, and cups; Everything you need to enjoy in your room or on the go. Call At Your Service from your room to place your order. Glenn Milstead, aka John Waters film star Divine, rests in the most famous grave in an otherwise sleepy burial ground.